The Oregon Forest Resources Institute (OFRI) has a very diverse set of stakeholders, including landowners, wood products manufacturers, foresters, educators, partner organizations, a variety of federal, state and local officials, architects, construction firms… and the list goes on. After meeting with all these stakeholders during my first few months as executive director, I can say with certainty that there is one OFRI publication that everyone requests: Oregon Forest Facts. In fact, many people I met pulled out a well-worn copy just to show how much it is used. By the time I started working for OFRI in July, we were down to our last stash of the 2017-2018 edition. Oregon Forest Facts is published every two years with the latest facts on Oregon’s forests and their social, environmental and economic impact. Today, I am happy to say that the wait is over! We have released the Oregon Forest Facts 2019-2020 Edition. 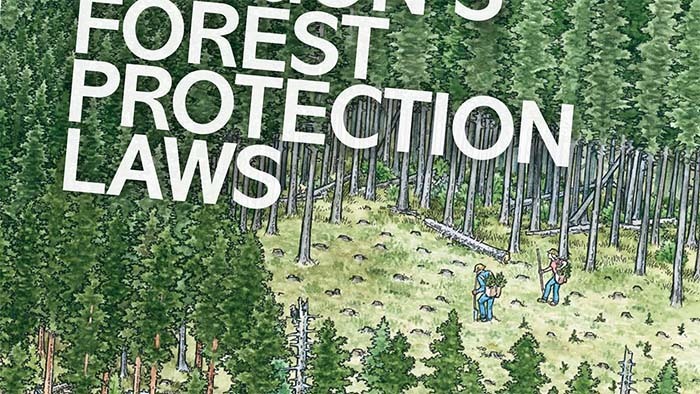 You can either order a free copy from our website, or if you need to get your hands on it right away, you can download a PDF version, as well as check out OregonForestFacts.org. - Nearly half of Oregon is forestland. Ownership of this land is split between government at 64 percent (federal, state and local), private landowners at 34 percent and Native American tribes at 2 percent. - Oregon has done remarkably well in protecting forests, farms and rangeland from development. In fact, 97 percent of all non-federal land in Oregon that was in resource land uses in 1974 remained in those uses in 2014. - More than 61,000 Oregonians are employed by the forest sector and depend on the state’s forests for their livelihood. The average annual wage of those jobs is $54,200, roughly 6 percent more than the average wage of $51,100 for all Oregon employment. - Oregon leads the nation in production of softwood lumber. Oregon’s lumber output of 5.5 billion board feet in 2017 accounted for about 16.2 percent of total U.S. production. - In 1971, Oregon became the first state in the nation to pass a comprehensive law regulating forest practices, the Oregon Forest Practices Act (OFPA), to ensure reforestation after timber harvest and to safeguard water, fish and wildlife habitat, soil and air. The OFPA has been updated 38 times since, to keep pace with scientific research. Overall, the booklet highlights how our forests are one of Oregon’s greatest treasures. They provide a wonderful place to recreate with our friends and family, and offer the cleanest water in the state, abundant habitat for fish and wildlife, and family-wage jobs. A great deal of time and effort goes into producing Oregon Forest Facts, and this latest version would not have been possible without the work of OFRI staff, especially Mike Cloughesy, Inka Bajandas and Jordan Benner. I hope you enjoy the Oregon Forest Facts 2019-2020 Edition; I know we already have another bestseller! I had a whole other topic I was going to use for this month’s blog, but then came news that the International Code Council (ICC), which develops building codes used throughout the U.S., had released the preliminary results of the vote on tall wood code changes to the 2021 International Building Code – and the result was a huge win for mass timber and tall wood buildings. Actually it was 14 wins, as all 14 proposed changes were approved by the ICC governmental voting members. 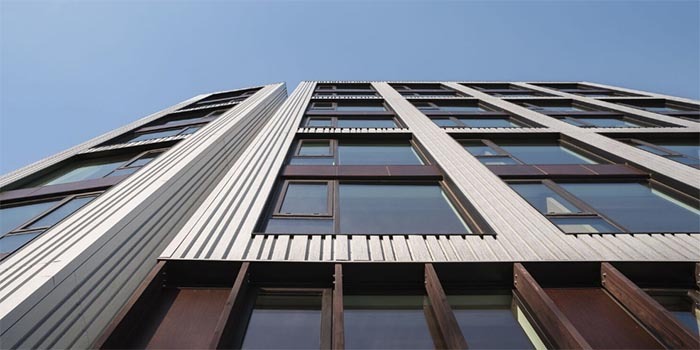 Once certified by the ICC’s voting committee and board, the provisions clear the way for three new construction types involving mass timber to be included in the 2021 International Building Code. Those three building types set building safety standards and protocols for wood buildings up to nine, 12 and 18 stories. “Approval of the tall mass timber changes is truly historic. For the past 100-plus years, model codes have consistently recognized traditional types of construction, and for the most part, they have remained unchanged until now,” says American Wood Council Vice President Ken Bland, a key player in the effort to develop the proposals and educate ICC voters. The news, of course, is a big win for the mass timber industry. It’s also a big win for Oregon, particularly for rural economic development efforts. Oregon is home to two of the three mass-timber-panel-producing facilities in the U.S. that hold the certification needed for making mass timber panels that can be used to construct buildings and for other structural applications. Cross-laminated timber producer D.R. Johnson Wood Innovations, based in Riddle, and mass plywood panel producer Freres Lumber, in Lyons, are well-positioned suppliers for what is sure to be an uptick in demand for mass timber building materials. The ICC vote is also a win for the building and design community across the country because it provides architects and contractors one more prescriptively allowed option that aligns with building codes when they’re considering which materials to use for designing and building commercial structures. In addition, it’s a win for our forests because the mass timber industry has vast potential as a badly needed outlet for the type of timber harvested during forest restoration activities throughout the inland West. Finding a place for that wood fiber is critical as we seek ways to cover the costs of bringing overstocked forests back to a more fire-resilient, healthy state. Perhaps most important, it’s a win for the environment. Because trees sequester atmospheric carbon and wood products store that carbon, wood buildings are a significant tool in the fight against climate change. These code changes provide an easier path for tall wood buildings to be permitted and built, and therefore a lot more carbon can be sequestered and stored in these structures. When that happens, we all win. Attention now turns toward encouraging states and other jurisdictions to adopt these code changes as quickly as possible. Even though the changes are part of the 2021 International Building Code, there is nothing that restricts jurisdictions from adopting them prior to then. In fact, Oregon is leading the way in that regard, having voted this past summer to adopt the changes into the state’s 2019 structural code and establishing a statewide alternate method for applying the changes. This became effective in August. Washington is right there with us, having voted Nov. 30 to adopt the code changes into its building code. And California is not far behind. Gov. Jerry Brown issued an executive order calling for the state’s building code agencies to review the new code changes and consider proposing their adoption in the next code cycle, which would be California’s 2019 building code. We now have even more reasons to pop the corks. May you all have a happy and healthy holiday season. Attending the annual Society of American Foresters National Convention is always one of the high points of my year. One of the ways I participate is by volunteering to moderate a few technical sessions. I choose sessions that pique my interest. They’re usually related to forestry education, forest policy, private forestry or silviculture. When the convention was held in Portland in October I had the chance to moderate an excellent session on education, extension and communication. One of the talks during the session was perhaps the best I listened to at this year’s convention. It was titled “Best Management Practices Field Guides: Are they at Optimum Readability for Effective Implementation?” The talk was given by Emily Paye, a graduate student from the State University of New York College of Environmental Science and Forestry in Syracuse, NY. As indicated by the title of her talk, Emily’s research used standard readability indices to evaluate best-management-practices field manuals from various states. In her introduction, Emily pointed out that the average American reads at about a seventh-grade level. The purpose of her research was to find out if the average American reader would be able to understand the field guides written to educate landowners on the best forest management practices to protect water, soil and wildlife in their states. What this means is that to read and understand these field guides you should be able to read at a 12th- to 14th-grade reading level. This, of course, is much higher than the average American’s seventh-grade reading level. I was disappointed to see that the OFRI publication Oregon’s Forest Protection Laws: An Illustrated Manual was not included in the list of field guides Emily reviewed. When I brought this to her attention she said she assumed the manual was aimed at regulators, not landowners. I told her it actually is very much a field guide for forest landowners and loggers. While we didn’t quite match the reading level of the average American with Oregon’s Forest Protection Laws, we did better than the field guides Emily evaluated from other Western states. We apparently have some work to do – but I want to point out that grade-level readability was not explicitly used as a tool when we wrote Oregon’s Forest Protection Laws. It will be next time. In the meantime, if you want to see if your reading level is high enough to grasp the material in the newly revised third edition of Oregon’s Forest Protection Laws, check it out online or order a copy here. This past week, I was among a group of Oregonians who traveled to Washington, D.C., for the events leading up to and including the lighting of the 2018 U.S. Capitol Christmas Tree. I was honored to be among a group that showcased the best of Oregon. This year’s tree was harvested from Oregon’s own Willamette National Forest. It was an approximately 75-foot noble fir that made a 3,000-mile reverse journey on the Oregon Trail. The tree itself was representative of the best of Oregon’s abundant forests, but that was really just one piece of the story. During the many events that celebrated the tree in Washington, I came to appreciate everything and everyone from Oregon who played roles from small to large to put Oregon’s best foot forward on the national stage. On my first morning in D.C. 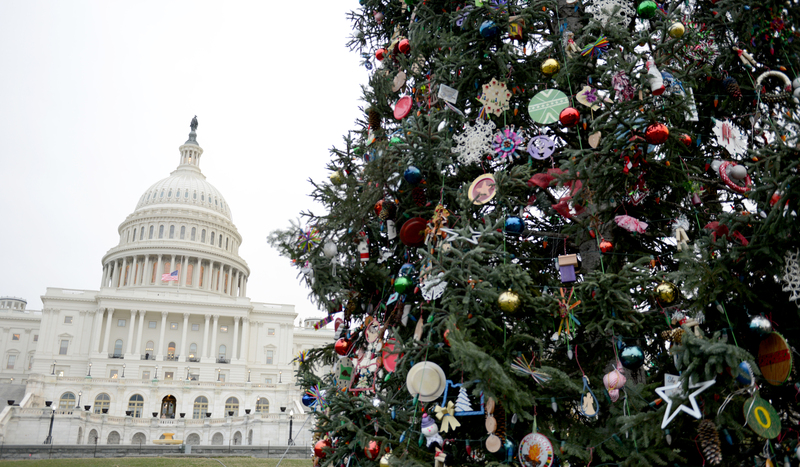 I walked around the West Lawn of the Capitol and spotted the tree, which displayed some of the more than 10,000 Christmas ornaments that were handmade by Oregonians from all over the state. At the first event of the week, held at The National Press Club, the tree’s partners were honored. Among them was the presenting sponsor, Papé Group, which is celebrating its 80th year in business in Oregon. Also recognized at this event was the town of Sweet Home, home to the U.S. Forest Service Sweet Home Ranger District, where the tree was grown. This was also the first time I met Brigette Harrington, a fourth-grade student from Hillsboro, and winner of Oregon Gov. Kate Brown’s contest asking students to write letters about what they love about the state’s outdoors. Once you meet Brigette, it’s apparent why she was selected the winner from among 1,200 entries. She is a poised and accomplished young woman, who stole the show by singing a Christmas song and playing her violin. The next morning I attended the Oregon Breakfast, in the Member’s Room of the Library of Congress. This event was hosted by Oregon’s senior senator, Ron Wyden, who was joined by Sen. Jeff Merkley and Rep. Greg Walden. The Travel Oregon team brought some of the best Oregon has to offer with Stumptown Coffee, Bob’s Red Mill oatmeal and even donuts that were specially made “Portland-style.” Brigette took center stage again at this event with a lively reading of her winning entry in the governor’s essay contest, a poem about her love for all things Oregon, including puddle-jumping, hiking, fishing and Christmas-tree-cutting. I met Brigette’s mother, Kim Harrington, at the breakfast. Kim is a fourth-grade teacher who takes her class to the Tillamook Forest Center for a field trip each year. She was grateful for OFRI’s school bus reimbursement program, which helps make the trip possible. Later that day same day I attended an afternoon reception at the U. S. Department of Agriculture (USDA). 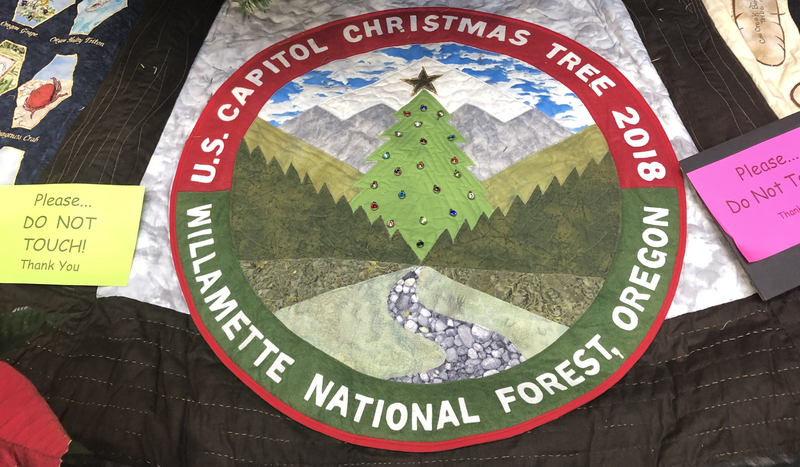 A little-known fact is that, in addition to supplying the “People’s Tree” for public display, Oregon provided an additional 75 smaller companion trees for offices and federal agencies around the Capitol. The Whitten Patio of the USDA features one of these trees. It is 22 feet tall and also decorated with handmade Christmas ornaments from Oregon. At the bottom of the tree is a beautiful handmade tree skirt that came from the Gone to Pieces Quilt Guild of McMinnville. Secretary of Agriculture Sonny Perdue spoke at this event and introduced another Oregon treasure, Nikki Swanson, a district ranger from the Sweet Home Ranger District. Nikki traveled with the U.S. Capitol Tree on its journey from Sweet Home to D.C. She described her experience of 20 consecutive days of joy, during the tree’s journey and at local events across the country. I jokingly asked her after she spoke if there weren’t some moments of stress along the way. She told me that every time a problem came up, everyone worked together to find a solution. The tree-lighting itself took place a couple days later on Dec. 6. 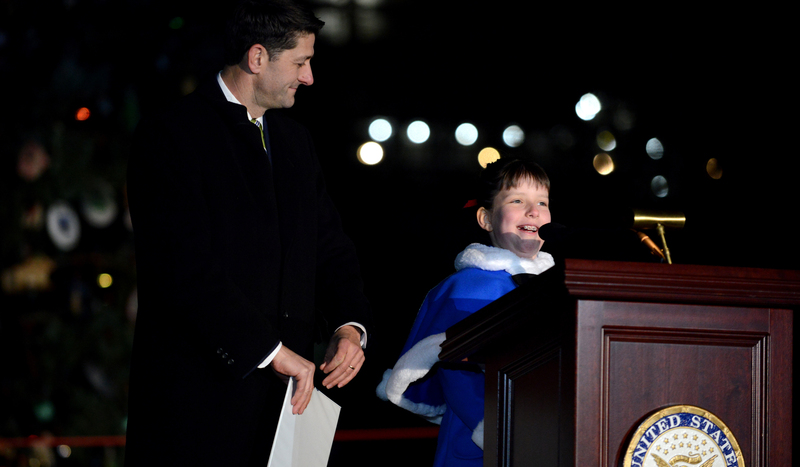 House Speaker Paul Ryan handed over the honor of lighting the tree to Brigette (on the right in the photo). Visitors from all across America stood in near-freezing temperatures and cheered after a brief countdown when the flick of a switch lit up the tree’s thousands of lights. 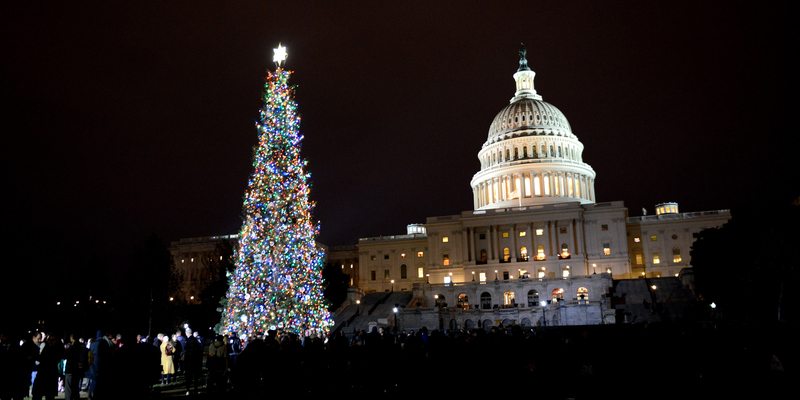 The 2018 U.S. Capitol Christmas Tree will be on display on the West Lawn of Capitol Hill until New Year’s Eve. During that time it will serve as a stunning showcase of Oregon’s natural beauty, our forests and the enthusiastic spirit of the Oregonians who made this gift to the nation possible.